This week there were few new movies premiered in Indonesia. It was a nice problem to have to decide which movie to see as opposed to none that was interesting. Due to some location and time preference, my wife and I chose to see this movie at Kuningan City. Movie's schedule was at 6.25 PM so I had to leave my office quite on time to make it there. Without further ado, here are more on the movie. Movie started with some brief scenes on the news about 9/11 attack in the US. As the follow up action by the US and to avoid future attacks by Taliban who were in Afghanistan where it became the base of operation of some major terrorists like Al Qaeda, a team was being readied to be sent there. Captain Mitch Nelson (Chris Hemsworth - Thor in MCU, Snow White and the Huntsman etc) was able to convince his superiors to be deployed there with his team. Along with 11 team members that include among others Cal Spencer (Michael Shannon - Revolutionary Road, Boardwalk Empire TV series etc), Sergeant Diller (Michael Peña - Ant-man, The Vatican Tapes etc), Milo (Trevante Rhodes - Moonlight), Nelson were deployed to the location and finally found out about their real mission. The team referred to as Operational Detachment Alpha 595 (ODA 595) had to go to the dangerous war zone and give the support to one of the militia leader in Afghanistan, General Dostum (Navid Negahban - Homeland TV series) to fight against the Taliban. With the very dangerous nature of the mission and the unfamiliar geographical terrain, Nelson and the rest of the team had to endure the difficult challenges to complete their task in very short designated time. So could the whole team do so? Find them all in this war action drama movie. It has been quite some time since I saw a rather heavy war action movie. And I pretty enjoyed this one as it had the elements of some very explosive intense war scene, especially the final part. That was totally full of amazingly done action sequence. And I got to say that Chris Hemsworth was able to portray a solid team leader in this heavy war. The appearance of some of the team members were also quite good, though majority were given less portion of their characters's background. The focus of attention was obviously given to Nelson, Spencer and Diller (who were portrayed by more famous actors). The only other member that was given a larger portion was Milo who gave some brief amusing moments. The movie started off with the usual characters introduction plus the background of the mission which took roughly half hour and was the part that I personally felt a bit long, but necessary. The action sequence as I mentioned above were pretty good, which were supported by some good explosion effects but mostly because of the very very good sound effects. There were also the background music which I thought were pretty good as they added the element of intensity throughout the action sequence. There was even one moment were there was only silence that I felt was put nicely in one of the scene (only disappointing thing was one of the audience made a noisy disturbing voice during then). I actually felt some of the action sequence scenes were having bit similarity with Michael Bay's trademark like the slow motion scene of helicopter flying. Perhaps the director Nicolai Fulgsig (in his directorial debut) was a little bit inspired by him? Who knows? In fact there was a Michael Bay's movie that I also liked and was based on true story in Middle East, i.e. 13 Hours: The Secret Soldiers of Benghazi. Anyway, I think this film was pretty entertaining. It was a movie with duration of a little over 2 hours which was sufficient to cover the main story of the mission itself (my wife was able to enjoy it without feeling too long). It had some drama and few fun moments, brief emotional moments which as usual affected my wife a bit. It also had some amazing war scene which was brutal, but not as brutal as Mel Gibson's movie Hacksaw Ridge. Nevertheless the movie was given an R rating which would mean not suitable for kids. So if you are looking for a war action drama movie set in the Middle East and based on true story, this one can be an option. But if you prefer a war drama purely focusing on the drama not the action, then this one might not be to your liking. The choice is yours. 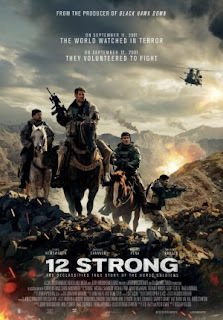 PS: The movie was based on the book Horse Soldiers which was based on true story written by Doug Stanton, an American journalist. The 12 persons sent to the Afghanistan truly exist in real life, but it seems the characters' names have been changed to respect the privacy. There was a nice tribute to them before the end credit scene.